Wellfesto (well-fes-to, noun): Wellness manifesto; a public declaration of intent, aims, and actions designed to optimize well-being now and in the future. It was always really easy for me to focus on my health when I was single with no kids and no worries, but as life has gotten busier, I’ve found I need to be more intentional about how I’m spending my time and more proactive to make sure my body, mind, and spirit are getting the care they need. I think this is true for any “project” that takes a lot of time (yes, I just called children a “project”). We have more to give when we’re starting from a position of strength and a foundation of well-being. A wellfesto is one of many ways to make a “formal” commitment to your own well-being. It can be just for you — scribbled down on a post-it note you see every day, or it can be something you share publicly with your loved ones and/or everyone around you. It’s a celebration of what’s working, and it’s an aspiration to keep trying new things. It’s real, yet hopeful. Constraining, yet liberating. It leaves room for big changes and small tweaks. It’s your non-negotiables…your guardrails…the way of living that guides the decisions you make every day. My wellfesto includes commitments to exercise, food, relationships, mindfulness, and work behaviors; so that’s what I write about here. But yours can be anything you want it to be. It’s written by you, for you. So that you live your life the way you want to be living it….giving you the strength to share your energy and gifts with the people around you. If you create a wellfesto and would like to share it, I’d love to post it for others to learn from. Just email it to brynn@wellfesto.com and I’ll add it to the site! Thank you! Just great reading what you have to say. Found your blog featured on wordpress.com yesterday. 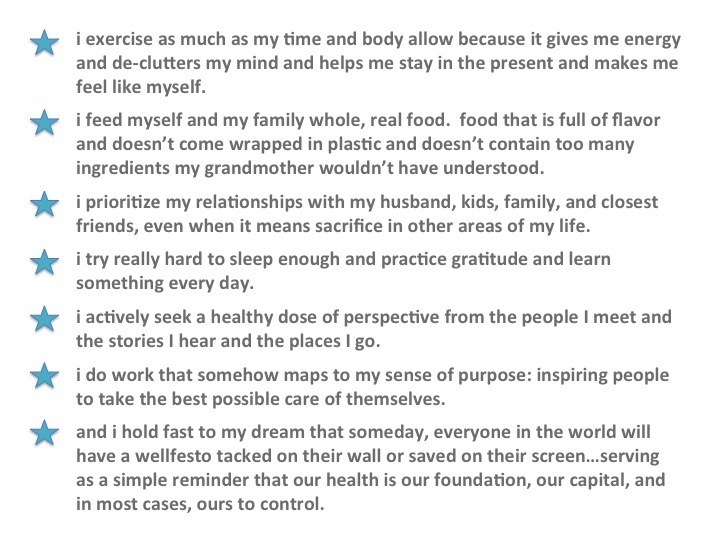 I agree with your philosophy and live like you (exercise, whole foods). Keep up the good work. Right now, I need your inspiration, so I’ll be following you. Thank you. Very inspiring. I am currently working on my Wellfesto. David – If you finish it and want to share it, I’d be happy to post. I just got one from someone today, and I am going to format and post it. Thanks!